Justin A. Cohn | The Journal Gazette Mad Ants guard Stephan Hicks drives for a basket around Raptors 905’s Aaron Best, left, and Kethan Savage on Friday night at Memorial Coliseum. 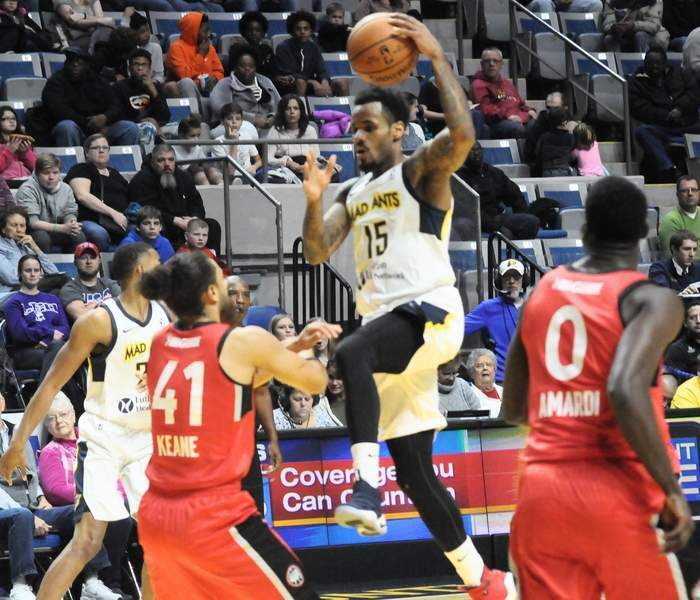 Hicks scored 17 points in the Mad Ants’ win. Justin A. Cohn | The Journal Gazette Mad Ants guard Walter Lemon Jr. goes up for a basket Friday at Memorial Coliseum against defending-champion Raptors 905, while he's defended by Kaza Keane, left, and Richard Amardi, right. 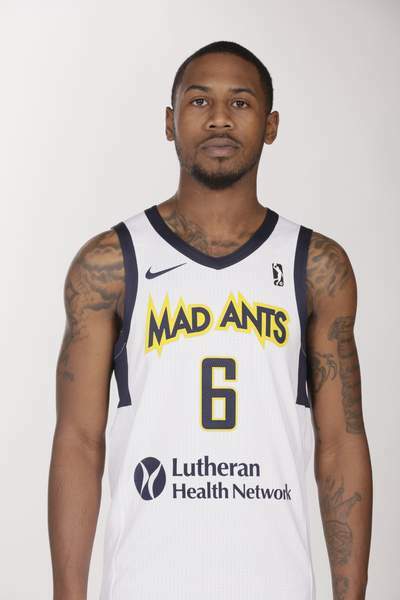 Justin A. Cohn | The Journal Gazette Mad Ants forward C.J. Fair is given some encouragement by coach Steve Gansey as he comes to the bench for a rest Friday at Memorial Coliseum. 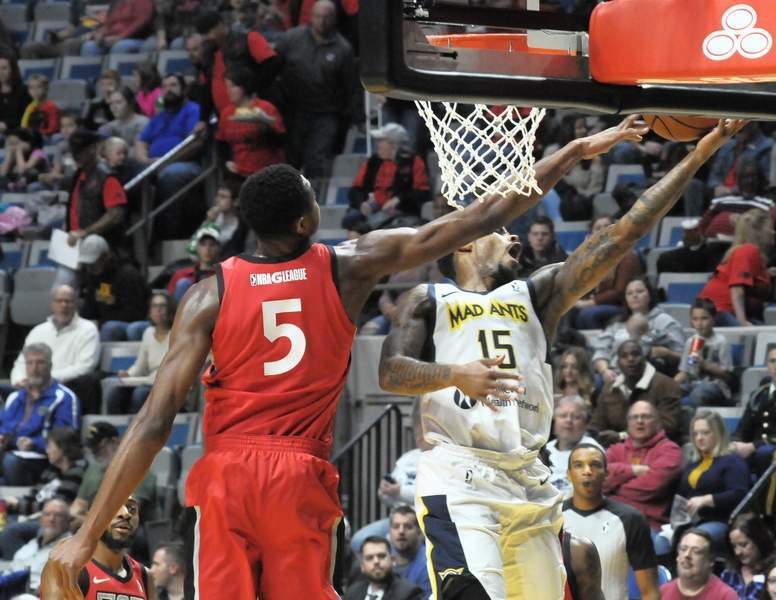 Justin A. Cohn | The Journal Gazette Mad Ants guard Walter Lemon Jr., right, goes up for a layup while ducking his head to avoid the arm of Raptors 905's Bruno Caboclo, a former Fort Wayne player. 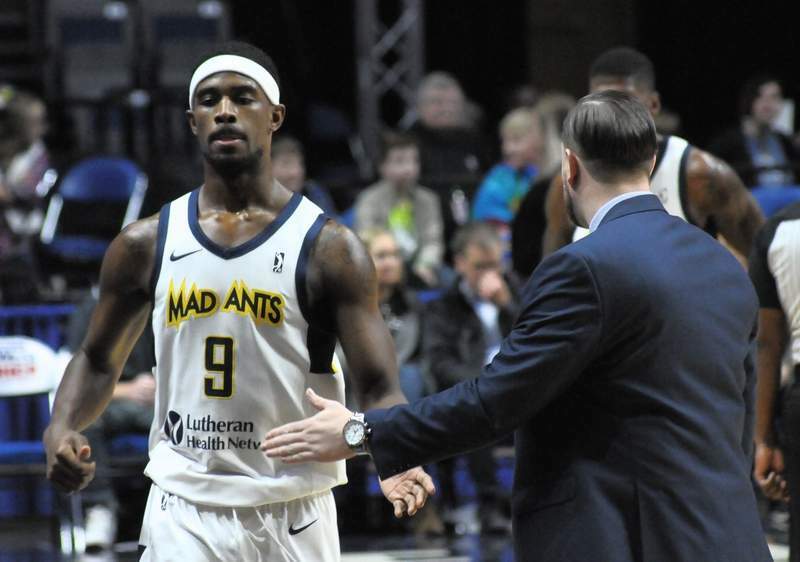 Je'lon Hornbeak didn't think he played that well when he attended an open tryout Sept. 23, hoping to snag an invitation to the Mad Ants' training camp. Coach Steve Gansey was more than cool with what Hornbeak, a rookie out of Monmouth, did that day and even more Friday night, when he totaled 18 points in a 104-77 victory over defending champion Raptors 905 at Memorial Coliseum. “That's what I expect from Je'lon,” said Gansey, lauding his willingness to shoot the ball (he was 3 for 11 from the field), his fearlessness from long range (3 of 7 from 3-point range) and his ability to get to the free-throw line (9 for 9). The Mad Ants (2-1) needed a dependable long-range shooter to fill the void left by Nick Zeisloft. Hornbeak, who played 15 minutes in the first two games, looked like he could be the guy, although Walt Lemon Jr. was again the offensive leader with 21 points to bring his season average to 26.7. 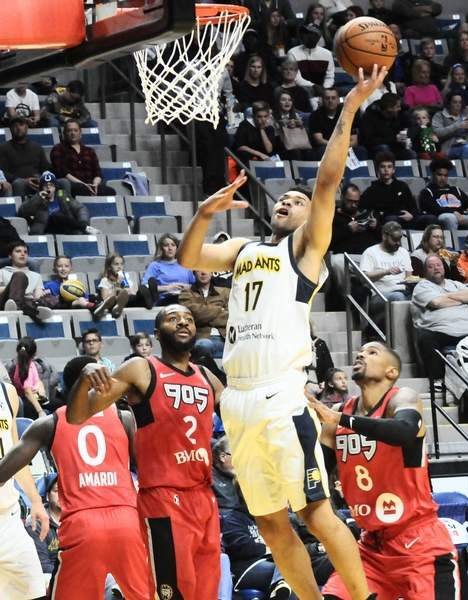 Hornbeak got 15 of his points in the first half, when the Mad Ants built a 57-40 lead, and they never trailed against the Raptors (1-2), who were paced by 14 points apiece from Lorenzo Brown and Davion Berry. Hornbeak, 23, who averaged 11.9 points, 4.3 rebounds, 1.8 assists and 1.5 steals last season at Monmouth, had two of the Mad Ants' 11 steals as they held the Raptors to 36.6 percent shooting. The Mad Ants outscored the Raptors by 27 points with Hornbeak on the floor. Stephan Hicks had 17 points for the Mad Ants, who play the Windy City Bulls tonight in Hoffman Estates, Illinois.